texte de la pétition: Costco: Stop selling animal cruelty! Costco: Stop selling animal cruelty! 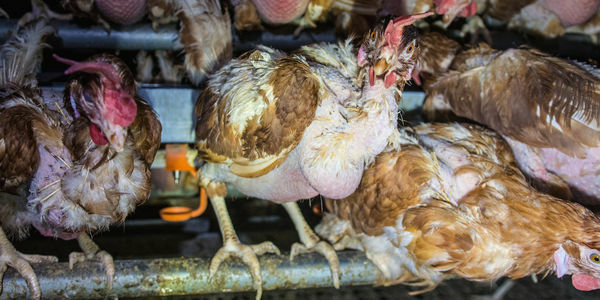 A recent Direct Action Everywhere (DxE) investigation showed horrifying abuse of hens at Pleasant Valley Farms, a Certified Humane cage-free egg farm in Farmington, CA that supplies Costco. The investigation was covered in the New York Times. Investigators found hens crowded so tightly they were covered in feces and perched on one another. The ammonia-filled air caused respiratory distress and disease. Hens, unable to reach food and stressed from the unnatural conditions, fought and pecked at each other, causing blood wounds. Some were literally cannibalized to death. DxE rescued a hen, Ella, who was starving, defeathered and covered in feces. Watch her video here. Costco customers and shareholders do not support these unethical practices. Sign our petition and tell Costco to stop falsely advertising their products as humane and cut ties with Pleasant Valley Farms and all companies that abuse animals.